Come on in! Take a look around, click on my links if you are looking for something specific.. 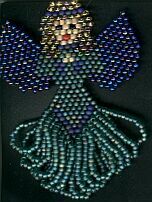 This Angel is from a Pattern Book by Rita Sova.. Click on the Angel to visit her site.. I had just quit smoking and DESPERATELY needed ANYTHING that would distract me enough to stop thinking about nicotine withdrawals....From the second that I made my first necklace, I was hooked!